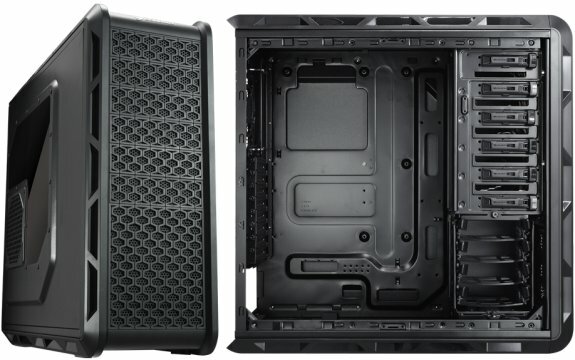 COUGAR, a leading global manufacturer of PC chassis and power supplies, today announced the launch of their COUGAR Evolution full tower PC chassis. The rugged tower is geared towards enthusiasts and gamers who demand the most out of their PC cases. With its spacious interior offering enough room for 8 PCI cards to provide ultimate flexibility for multiple graphics solutions and up to 7 fans equipped with a unique dual-fan-set management system, the COUGAR Evolution sports excellent cooling and ventilation characteristics that are the ideal foundation for a professional gaming system packed with the highest end components. But most outstanding is the exclusive and eye-catching fan control knob which allows for dual-fan-set management. Now gamers and enthusiasts can arrange their fans within two groups. A typical usage scenario would be to arrange fans around the VGA cards in one group and the rest in another group; in doing so, users can easily tweak up ventilation around the most stressed components when under full load, such as heavy gaming, video editing or rendering. As soon as one goes back into normal usage the fan speed can be turned down with ease, thereby effectively maximizing cooling according to the individual needs. With the newly available COUGAR Vortex series of PC case fans, further ventilation upgrades are easily done as they also come entirely tool-less with fix pins for convenient installation. Also included with all fans of the Vortex series are built-in anti-vibration pads to reduce noise. Vortex fans come in both 120mm and 140mm sizes with three different versions; standard Vortex with 3-pin and Hyper-Spin bearings, with 3-pin and Hydro-Dynamic Bearing and finally 4-pin PWM with Hydro-Dynamic Bearings. Setting these fans apart from the crowd of available case fans on the market are the high Vortex Airflow innovative turbine blade that focuses the airflow in order to optimize overall cooling efficiency in combination with the patented frame that further helps to increase efficiency as well as operational silence. These unique German design characteristics make all the difference. On top of the COUGAR Evolution full tower chassis is a thoughtfully arranged user interface with 2 x USB 3.0, 2 x USB 2.0 connectors and HD-audio connectivity with one microphone and one headset/speaker connector. Also conveniently located on the top of the case is a hidden hot-swap docking station for 3.5” HDDs or 2.5 SSDs. This docking station is covered by a lid which provides protection against dust and even light water spills. When it comes to looks, the COUGAR Evolution stands out with a combination of rugged elements consisting of honeycomb and mesh intake designs adding to its overall chiselled appearance. The entirely screwless design makes upgrades and components exchanges as well as regular maintenance and cleaning a breeze, even for novice users . The COUGAR Evolution is available in two different colors, “Pure Black”, and “Galaxy White”, at a price of $94.99.